I have some important news to share, I will contiuning some of the blog series (started here) at another blog. As announced yesterday, I have launched the new blog today. Hope you will like this change. Also, I have changed the look of this blog as you would notice. Hoping I will continue to provide quality content on both blogs and interested readers may read more about the new blog. I was wondering whether to blog this or not. However, I felt its important the NetBeans Community must know this. 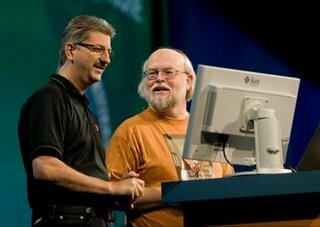 Last month at JavaOne, Sven Reimers who received Duke’s Choice Award, inducted James Gosling into the NetBeans Dream Team Wall of Fame. Thank you so much! I have setup a new blog for my experimental work, I like to carry out either with NetBeans Platform or any other technologies. I will be announcing it tomorrow.